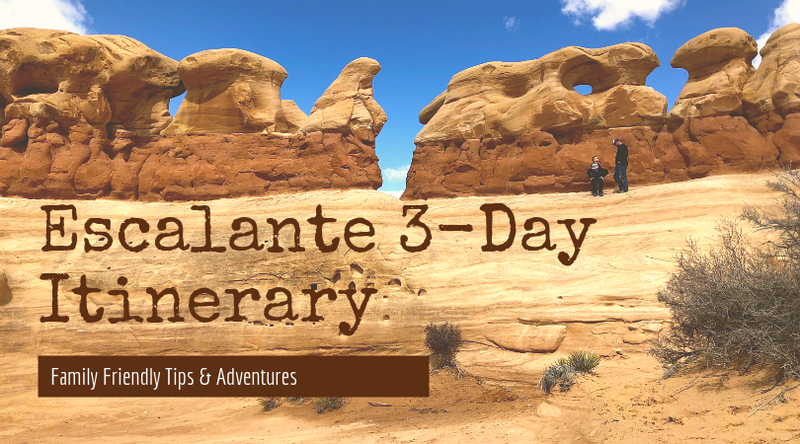 On our last roadtrip we spent an extended weekend exploring Escalante, and we are sharing our itinerary with you to help make your trip a little easier. Individual links will take you to our more detailed review of each activity. 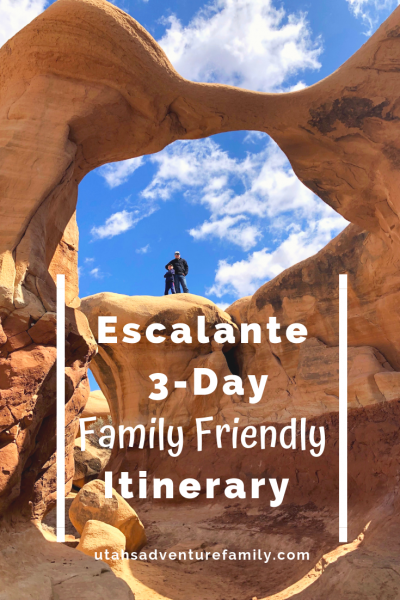 We also created a printable Escalante 3-Day Family-Friendly itinerary which you can download at the bottom for FREE. 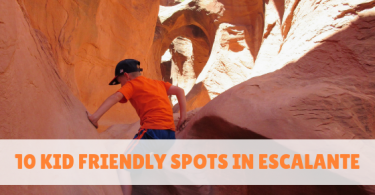 We have visited Escalante a few different times, and we are always amazed at everything there is to do near this small town in Garfield County, Utah. Grand Staircase Escalante National Monument surrounds the town and provides lots of family friendly adventures. The best part is that most of these activities are free or cheap. Everyone will be coming different distances, so we aren’t going to provide an itinerary for this day. We left after school on Friday around 4:00 from Lehi, which put us in Escalante around 9:00 with a short stop for dinner. If you are coming earlier, then use some of the other ideas provided below to fill in your itinerary based on which direction you are coming from. You can also use our Restaurants by County post to find a place to stop for food along the way. 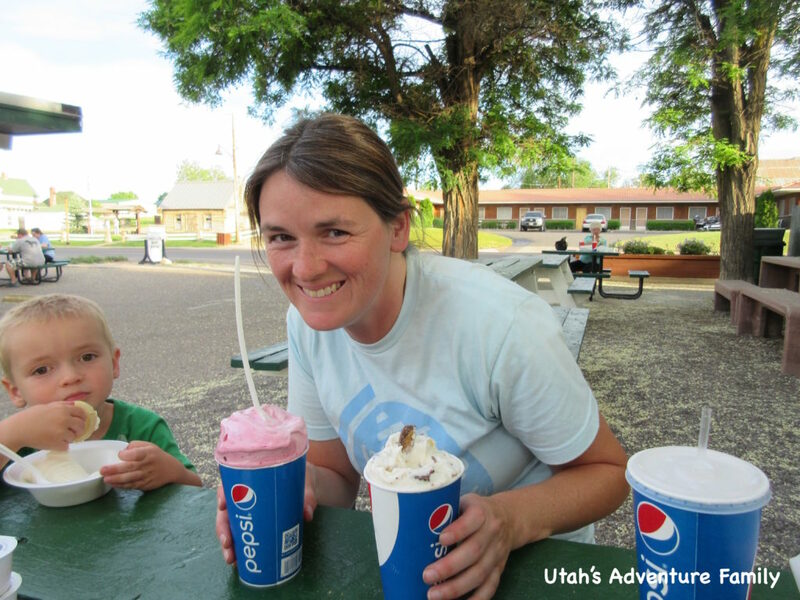 If you need ideas on where to lodge, we loved staying in the Escalante Yurts. If you’re on a tighter budget, we stayed in the Bryce Canyon Villas cabins in Cannonville and had a wonderful time, too. Ruby’s Inn is another popular spot, but that is back by Bryce Canyon. There are many other choices for lodging and camping. Leave early and head toward Boulder. We left at 8:00 and spent about an hour exploring Anasazi State Park. 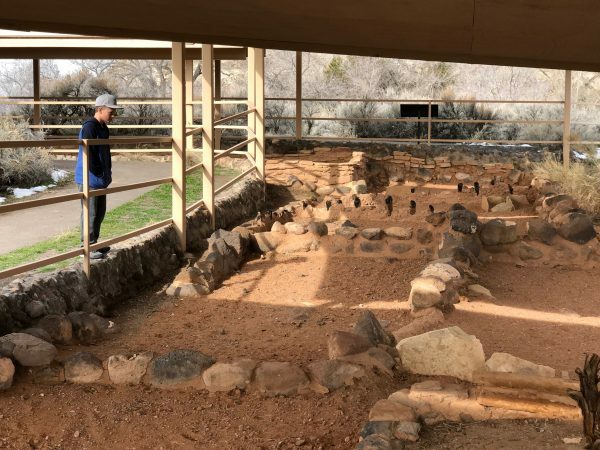 This is a small state park, but its $10 entrance for the entire family, so it’s worth the stop for a short historical lesson and to see the interesting ruins and artifacts. Make sure to do the Junior Ranger program and earn a badge. The ruins at Anasazi State Park. Head out on the Burr Trail Road toward Bullfrog. This road was an old cattle drive road, and can be driven all the way to Bullfrog at Lake Powell. The first 30 miles are paved, but our recommendation is to drive the first 18 miles. This takes you through the section called Long Canyon which is the most beautiful section of the paved road. Stop at mile 11.5 and hike to Singing Canyon. This short slot is beautiful and fun to sing in, hence its name. After 18 miles, turnaround. 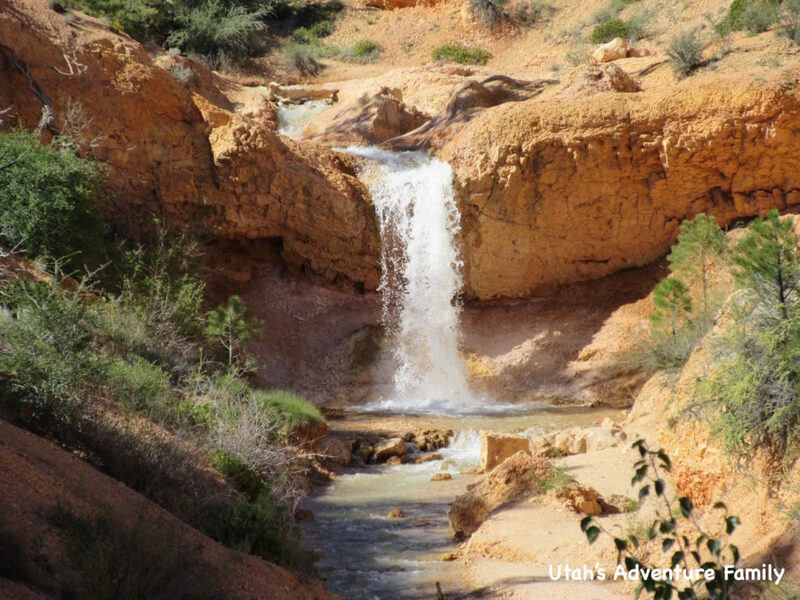 After spending time driving the Burr Trail Road, head back west on Highway 12. Have a picnic lunch along the way. We ate when we got to Lower Calf Creek Falls, which was our last adventure for the day, but you can have lunch anywhere you’d like. Lower Calf Creek Falls is a 6 mile hike, so this is not for every family. It’s an easy hike, and the waterfall is spectacular, but we were glad we waited until our youngest was 6 before attempting this distance. It took us about four hours to hike to the falls and back. 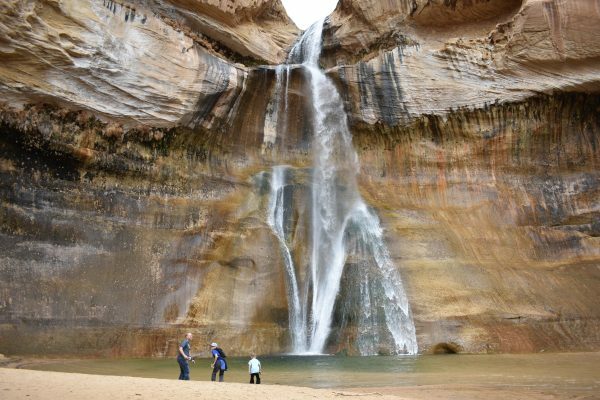 If you are not going to hike to Lower Calf Creek Falls, then see our optional day listed at the bottom for a hike more appropriate for younger kids. Also, if you visit in the summer, we would probably hit this trail early to avoid crowds and to be able to find a parking spot, so you could do this day in reverse order. Lower Calf Creek Fall is amazing! 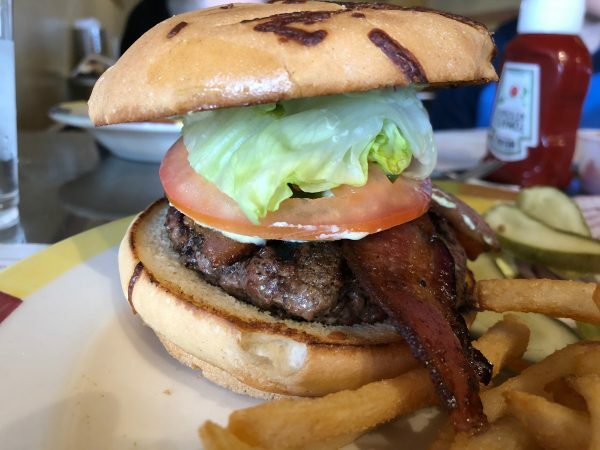 After hiking, head back to Escalante and enjoy a delicious burger at Circle D Eatery. Their beef is all locally raised and natural, and yummy. Everyone was friendly and the service was great. Get a good night’s rest after that long hike because you’ve got another big hike tomorrow. Make your first stop at the Grand Staircase Visitor Center in Escalante to check on road conditions and get a map for Peek-a-Boo and Spooky (or print one out before you go). Ask any other questions you’d like before you go, too. 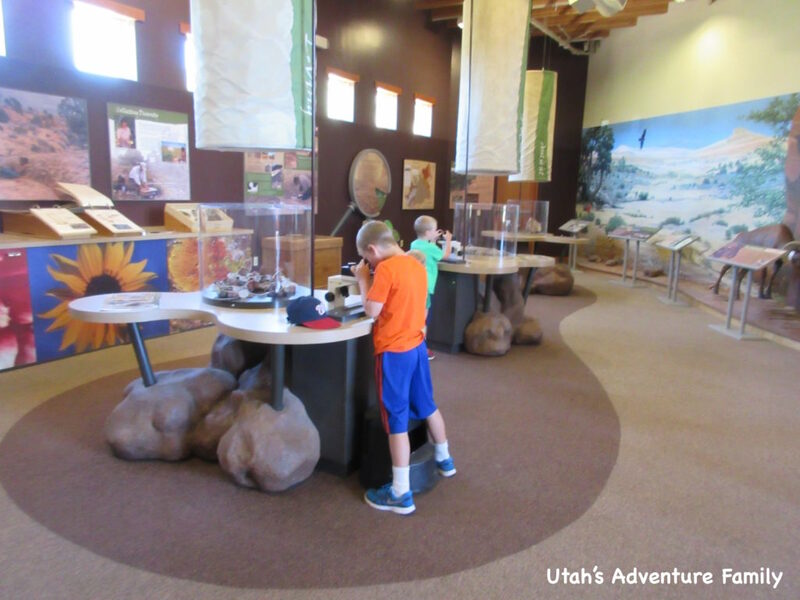 The Visitor Center has some fun activities for kids while you chat with the rangers. Just west of town, visit Escalante Petrified Forest State Park. 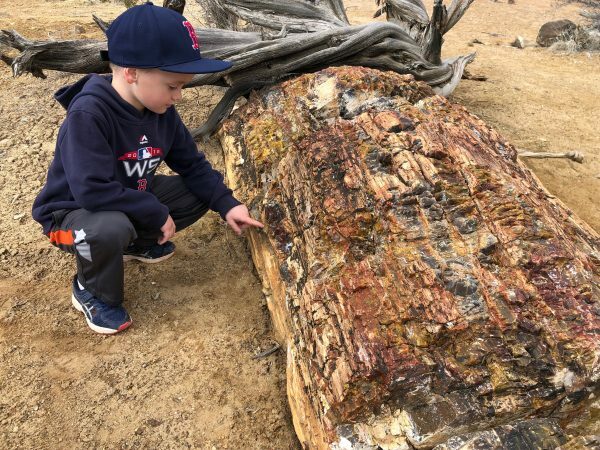 The petrified wood is so cool to see and very colorful. There is a short 1.0 mile moderate trail that is great in the morning or evening because there is no shade. The reservoir is also a fun place to swim or fish in summer months. The pieces of Petrified Wood are so amazing to see. The rest of the day will be spent on Hole in the Rock Road. Head out on the dirt road for 12 miles and turn toward Devil’s Garden. There are picnic tables, so it’s a great place to have your picnic lunch. 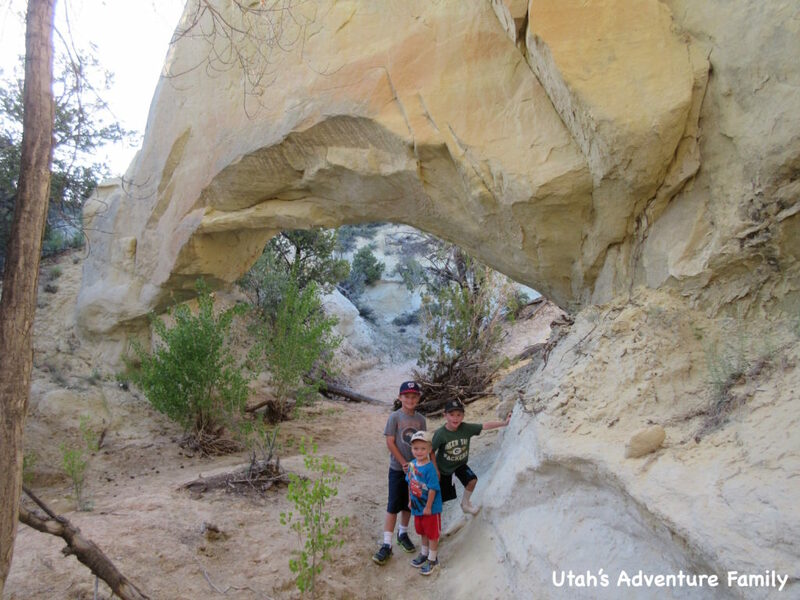 After lunch, explore Devil’s Garden, which is our boys’ favorite place to play. There are two different arches and lots of places to explore. It’s a great spot to play hide and seek as a family. 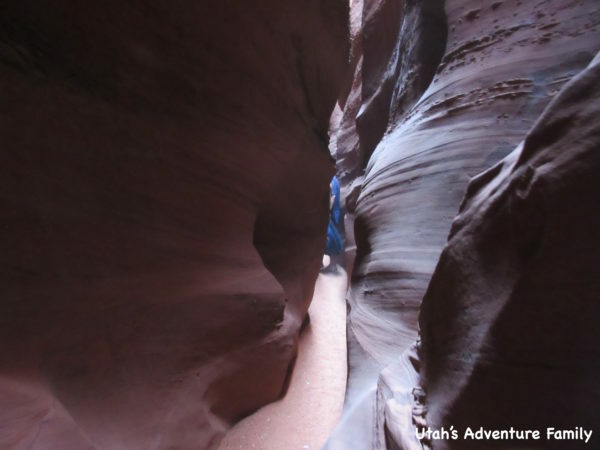 Head a little further down Hole in the Rock road to Peek-a-Boo and Spooky slot canyons. The turn off to these canyons is at mile 30. Then you have to decide what your vehicle can handle. The first part of the road is smooth and then comes to a parking area for those with low clearance. If you park at the first lot it does add 1.0 mile each way to the hike. The road continues, and if you have good clearance, you can drive right up to the trailhead. 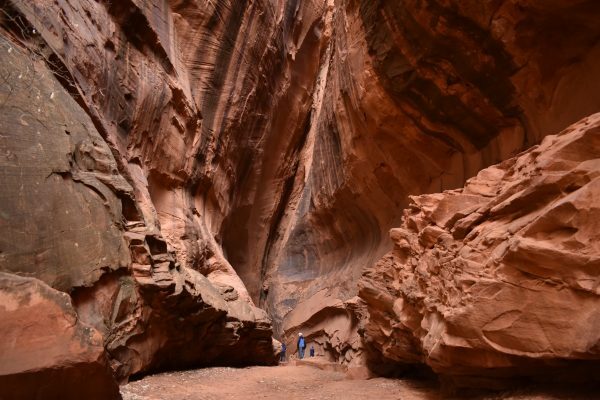 From this point, trail is 3.5 miles and goes through some of the most famous slot canyons in Utah. Make sure to take a map because there are not trail markers, and don’t wear big backpacks because you will barely be squeezing through Spooky. I wouldn’t attempt it with a toddler on your back. It is a tight squeeze, but so much fun in Peek-a-Boo and Spooky! 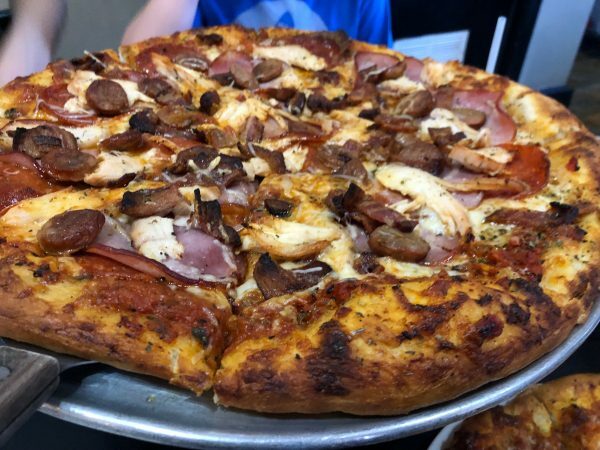 After your amazing hike, return to Escalante and eat pizza at Escalante Outfitters Pizza. They have pizza, salads, and sandwiches. 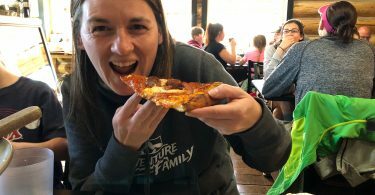 The sourdough crust is really delicious! Before you head home, there is one last hike you must do. This was our boys’ favorite hike in Escalante passing both Lower Calf Creek Falls and Peek-a-Boo and Spooky, which are two of their all time favorites. 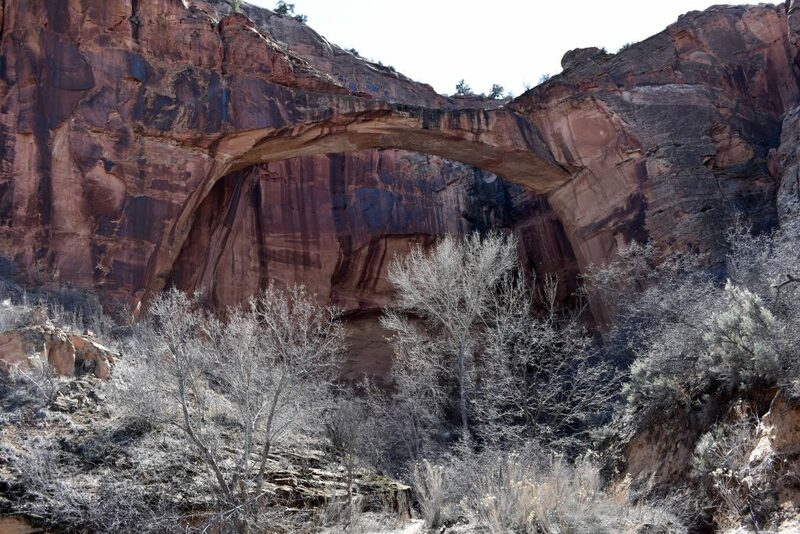 The Escalante Natural Bridge trail is about 12 miles outside of Escalante and it has 5 river crossings each way, so 10 total. This is why our boys loved it! Best of all, you end up at a beautiful Natural Bridge that you can hike right under. The trail is flat and easy and only 3.5 miles roundtrip. 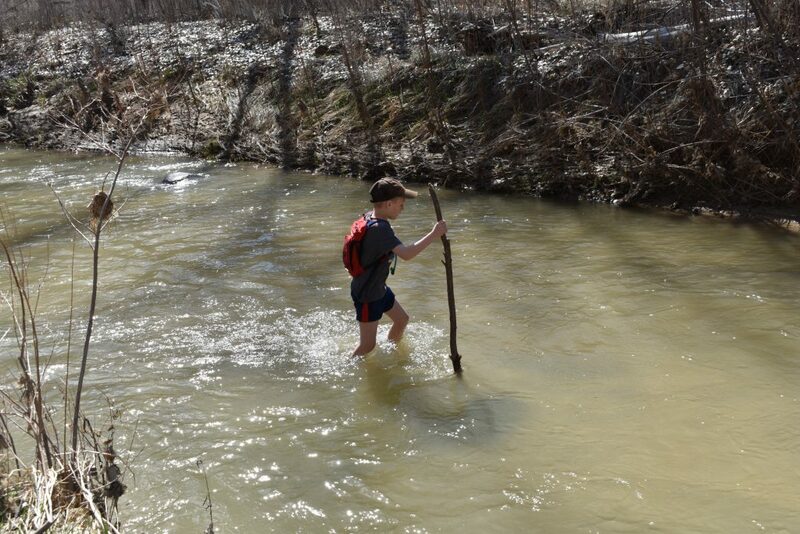 The river crossings make this hike so fun for kids. Enjoy lunch at Nemo’s before heading to your next destination or home. We love the shakes and fries at Nemo’s. They are not open on Sundays, so plan accordingly. Yes, I needed two shakes from Nemo’s. Do you have more days in this area? There is so much to do near Escalante and in Garfield County. Here is another day full of adventure if you have more time or want to supplement some of the ideas above. From Escalante, head to Cannonville. It is a 35 minute drive. From Cannonville, head to Willis Creek. 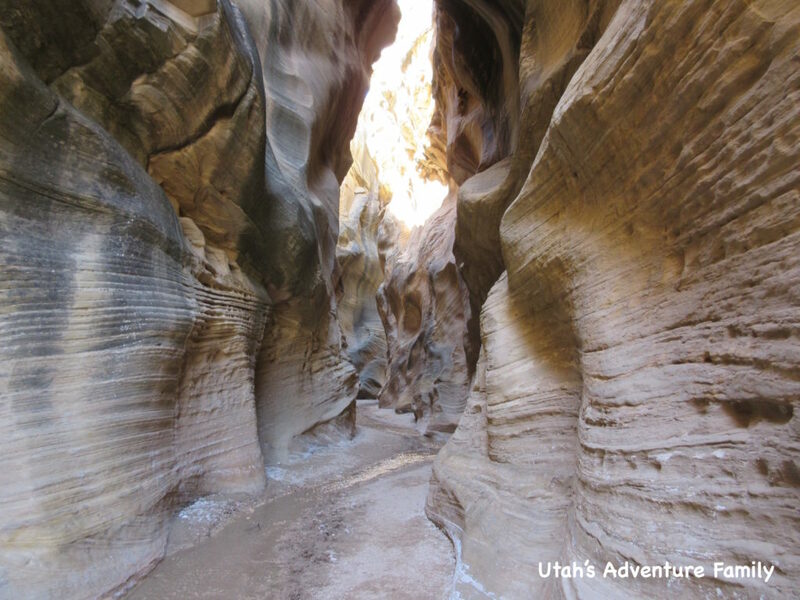 This beautiful slot canyon is an easy walk that follows the creek for as far as you’d like to go. It has a little waterfall and is fun for the kids as you hop back and forth across the creek. Willis Creek is an easy slot canyon. After hiking Willis Creek, eat a picnic lunch. Then head to Kodachrome Basin State Park. 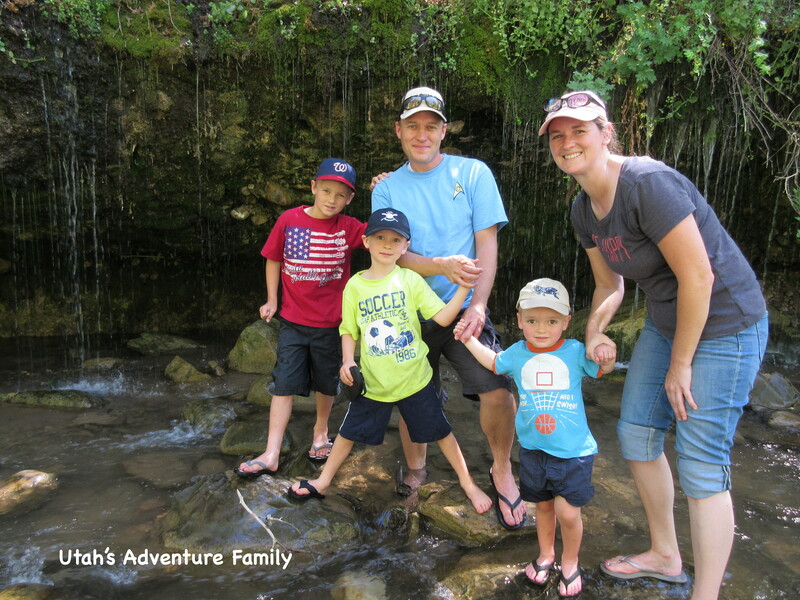 There are 5 great hikes for families, so choose one to fit your family. We recommend Angel’s Palace and Shakespeare Arch. Angel’s Palace in Kodachrome basin has beautiful views. That should fill your day, but if you have more time, drive to Mossy Cave and hike this short trail that is part of Bryce Canyon (located outside the fee area). It leads to a waterfall and Mossy Cave, which is more of an alcove than a cave. 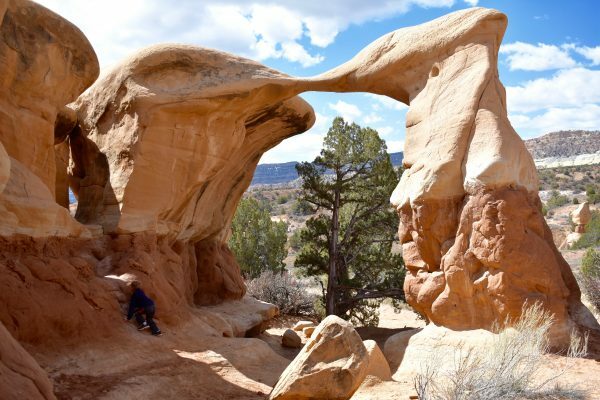 One more adventure that we enjoyed near Escalante was the Covered Wagon Natural Bridge. It is part of Grand Staircase Escalante Natonal Monument and is in the middle of nowhere. The natural bridge is like a small arch, and we loved the shady sand behind it. 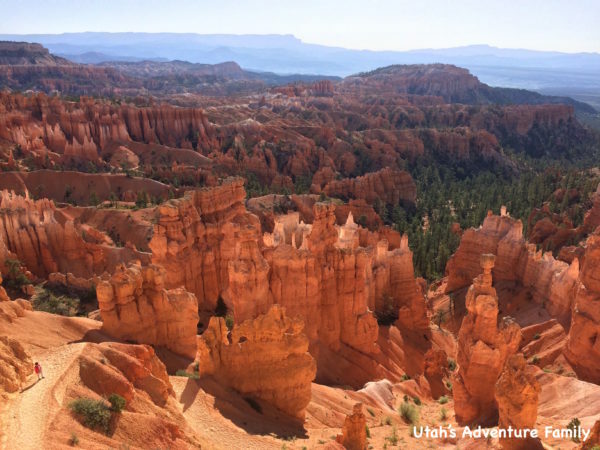 If you are still looking for things to do, make sure to check out Bryce Canyon National Park. We have lots of info about kid friendly hikes and things to do in this beautiful park. We think 2 days at Bryce Canyon is a great amount of time. 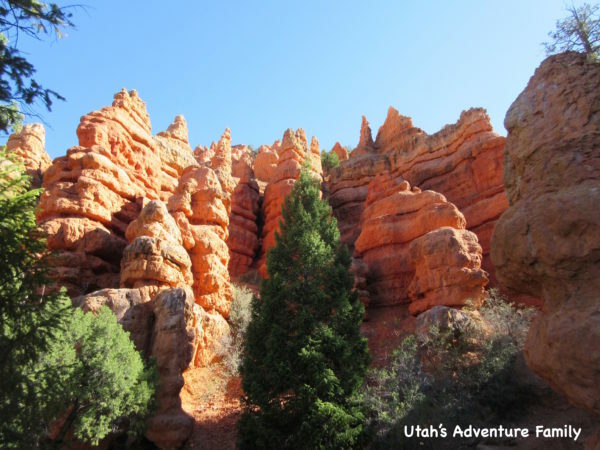 Another great stop along Scenic Highway 12 is Red Canyon. We like to stop on our drive down since we come through Panguitch and head over to Escalante. Red Canyon is free, and is like a little Bryce Canyon. There are fun trails and a small Visitor Center (open seasonally). Red Canyon is a beautiful stop. 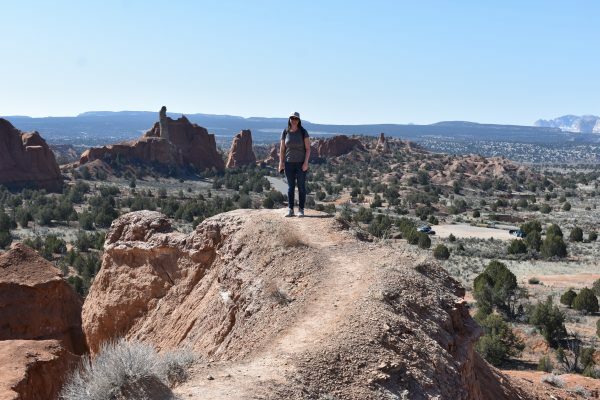 We hope that this itinerary helps you plan your trip to Escalante and Garfield County. We love this part of Southern Utah. Here is the printable itinerary! Bryce Canyon Country paid for a weekend trip for our family to visit Escalante, but our reviews are our own opinions. Some of these suggestions come from the sponsored visit, but most of them come from our other visits to the area. Great itinerary! I so want to do singing canyon. Thanks for the food suggestions. We’ve only eaten at Nemos so it’s good to know there are other good options. One year we camped at Kodachrome and loved it. Singing Canyon was super fun. Short, but still gorgeous. And we love Nemo’s, but it’s nice to have a few other options! Thanks for the feedback!! We appreciate it!